Being a rural county, surrounded by other rural counties, with ideal land for cattle to graze, it is not surprising that the likes of Muller yoghurts set up home here. Neither is it much of a shock to see that a number of good quality cheese makers have taken advantage of all this milk to produce some award winning cheeses. Shropshire Blue may be the cheese that most people would incorrectly associate with the county. If you want to know what we really make here, click through to some of the producers on this page. In the name of scientific research we have tried almost all of them and have not been disappointed. 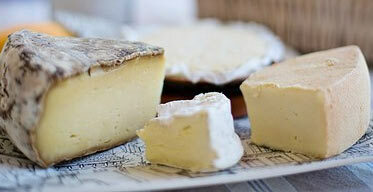 Artisan Goats Cheese made using milk from their own goats. The cheese is made using slow-processing traditional methods, allowing the delicate and subtle tang of classic goats cheese to develop over time. Producers of high quality tasty handmade cheese in a traditional manner. Varieties include, Shropshire Red, Tanatside, Tanatside with Apricots, Tanatside with Cranberries, Marches Blue and Tanat Cheddar. Handmade cheeses using traditional cheese making techniques which have been tried and tested by countless generations of farmhouse and specialist cheese makers. Mike from Grove Farm's herd of British Friesian cows. A large range of regional and organic cheeses including the local Cheshire cheese have been made at Belton Farm since the early eighteen hundreds. Today Appleby's of Hawkstone produce one of the only hand-made cloth bound Cheshire Cheeses to be made in the 'old fashioned' way. It is produced using a traditional recipe and milk from the Appleby's own farm. Cheshire Coloured or White, smoked or non smoked and Double Gloucester. British Cheese Awards winning cheese by Dudley Martin uses milk from their own Friesian-Holstein cows and matured on beech racks.